This journal started as a survey inquiring into a complex world of female artists. I want to share work of inspiring and creative women who make this world a brighter place. An Interview with Aimée Burg. Aimée Burg is an incredibly talented artist, fierce woman, and mother. Since meeting Aimée a few years ago I have been admiring her talent and woodworking skills. Not everyone knows how to operate a table saw. And that is an impressive expertise to have! Aimée has a show titled Oblique Functions at Slag Gallery in Bushwick which is on view till December 22nd, 2017. I had a pleasure to ask her a few questions about her work, and what it means to her as a woman and creator. In this show Aimée experiments with notions and perceptions of domestic life and household tools. She explores ideas of what it feels like to be a woman in the modern world, what it takes to juggle between different roles that she is: a mom, wife, caregiver, artist, educator; and how household tools help her sustain a busy life. 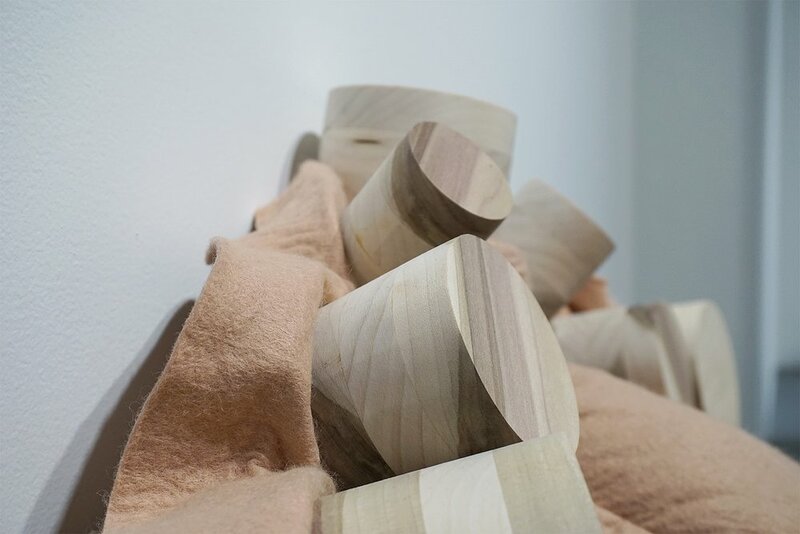 In her work Aimée utilizes familiar building materials such as wood, cement, porcelain, stoneware, mason line (a handy twine used to erect straight walls by masons, hence the name). With these she creates unusual forms and assemblies by employing simple and clean geometries. However, her fabrication methods are not so simple. The objects created have a subtle color palette: yet the show awakens exciting and playful feelings. In the show we see strange combs, clothes lines, gloves, baskets, tables, sacks, curtains, mirror frames and looms. Aimée transformed the idea and ordinary look of these everyday objects and gave them life on their own. 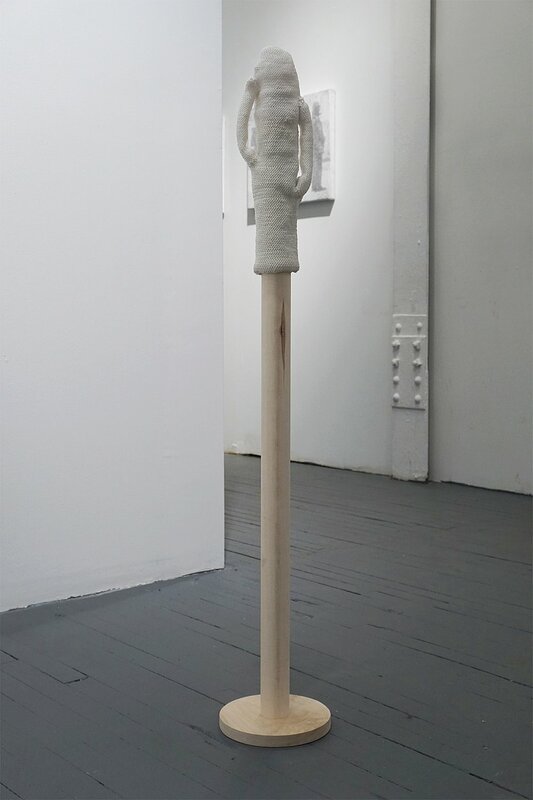 One of my favorite pieces from the show is a fuzzy sack with round wooden plugs. It has a texture of a soft supple blanket. I find comfort in domestic objects; we interact with them every day and depend on them. Women particularly rely on house tools to get through their busy days while performing various tasks, be it cooking, running business, cleaning, taking kids to school, creating art, volunteering, the list goes on. 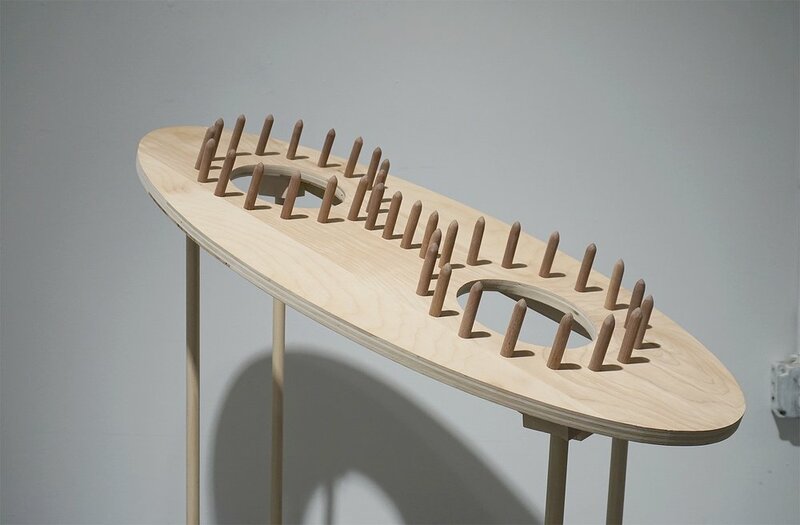 I appreciate the fact that Aimée turned ordinary objects into a subjects of her research, and manifested them as sculptures we can see and experience. Her work makes me think about how would my daily life change if my household tools and instruments were to look unearthly and different from what I am used to now? Will they bring me more joy, more delight? Would my life be more efficient? Does form follow function or vise versa? Visiting the opening of the show I felt transported to another dimension or to a futuristic household on a different planet. Suddenly, I started to think about the use these curious tools could have. Which led me to wonder to question are these tools or strange creatures? I was struck by what these curious tools Aimee imagined to be, and what purpose they serve. I wonder what tools would be important in people’s homes in the future? And what today’s tools will become obsolete? Would ceramic arts still be relevant? Aimée Burg. Photo by Dark Matters Collective. Your latest solo show Oblique Functions is mostly made out of objects. What was your inspiration behind the forms & materials? There are a lot of things that have inspired the objects, and I’ll just start listing some - cleaning tools/household tools/goods/equipment, dealing with the role of being a stay at home mom, background sets in tv shows/movies, looking at old ways of working, thinking about working with my hands, choosing to not use toxic materials but rather materials that are comforting and fun to work with, combining opposites like hard/soft, crisp/lumpy and gentle/violent, being a housewife and feeling like I have to protect creatures that live here - humans, animals and plants alike, femininity and figuring out what that means for me as someone who has never really felt feminine, ancient cultures and beliefs are always in the back of my mind, ways of learning and tools used in early childhood development. What do you do to stay inspired? What are your daily rituals? My daily rituals are guided by the people/animals that I’m in charge of - like my son, cats and chickens, and even the plants. Since my son is an early riser, I am became one as well (my house animals are also early risers). I spend a lot of time feeding and cleaning living things (this is in no way a claim to a clean and organized house and lifestyle though!). Once my son is out of school for the day he has other enriching activities that I take him to, which I guess leads to the next question. Did becoming a mother change your approach to art and creation? If so, how? Yes - most definitely. I‘ve learned to work quicker as the time I can allow myself in the studio is less than when I didn’t have my son. By quicker I mean thinking about the effect I want and what would be the most direct way to get it which sometimes means that objects are rough around the edges and not finished to perfection like I would have fretted about in the past. I also started investing more time into my crochet work because it is something easy to travel with, and is not messy or loud. I can work on it while my son is at gymnastics or whatever activity he is at. I also have taken inspiration from the way he creates his drawings. I find myself wondering how I would make shapes he draws into objects. What advice can you give to artists who are just starting up? I would advise to just keep a collection of things that interest you. Even if they seem really varied eventually they all come together, because the core belief in the way I work is that everything is connected and can turn into this connect-the-dots mental game. Everything informs everything else, kind of like how you can play the 6 degrees to Kevin Bacon game. What are your favorite things about living on the East coast? Well...I have only ever lived on the East coast so I do not have much to compare it to, however having all four seasons is really important to me. Always having that change coming up keeps things on the move. When people I meet find out I am from Maine, a lot of the time I am told that ‘it makes sense’; that Maine people have a ‘thing’ about them. I find it important to hold on to that ‘thing’, and staying close to my family helps me to keep that. Though I don’t necessarily know how to describe what that Maine thing is. I have been told it is both that Mainers are hard working and weird. Are there any creative adventures coming up in the near future? I am lucky to be included in a group show Probability and Uncertainty coming up soon at Mandeville Gallery at Union College in Upstate NY. A major thing is that another kid is on the way so I will be preparing for that. Otherwise ongoing projects are co-running the Art Lot in Brooklyn and being a member of Dark Matters Collective. Find more of Aimée's work on her website www.aimeeburg.com. Photos courtesy of Plants and Magic unless otherwise noted.